One of the best parts about living in the Hill Country is that there are so many options for upscale food and drink. Between Austin and San Antonio, this area is arguably the place of the Texas food scene. However, it is equally as nice to enjoy the simple pleasures of a cold beer and a hamburger in a funky little dive seemingly out in the middle of nowhere. 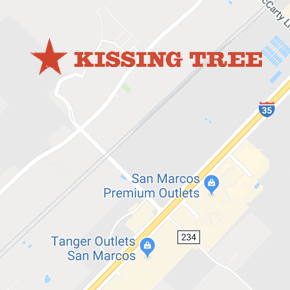 To give you a break from the upscale foodie scene, we at Kissing Tree have complied a list of our favorite no frills local spots throughout the Hill Country. No need to thank us, we already know you’ll love them. Built as a service station in the 1930s, Zelicks has become the outdoor bar in San Marcos since opening in 2011. A true Texas ice house, Zelicks throws the best Texas Independence Day party this side of the Pecos. A day at Zelicks must include sipping on a frozen margarita in one of the spacious Adirondack chairs on the back patio. Go for the jalapeno cilantro marg if you are feeling adventurous! The Phoenix is a bar and chili parlor that has been a New Braunfels staple since 1871. Located in the heart of downtown, the Phoenix’s boasts live music weekly and their award winning chili has been featured on both the Food Network and the Travel Channel. So sidle up to the bar, order a bowl of chili with a single shot, grab a cold beer and enjoy the any of the fantastic acts playing on the center stage. One of the best kept secrets of the Hill Country, the Lonestar Floathouse sits right on the Guadalupe River across on the beautiful River Road, a road that winds along the Guadalupe through the natural limestone cliffs of the Hill Country. In addition to being one of the most picturesque spots on this list, the Floathouse boasts one of the best burgers in a 100-mile radius. Set in a quiet neighborhood in New Braunfels, this beer and wine only spot is zero frills. The Hoity Toit is your basic local dive bar, with smoking still allowed inside and pool tables set up in the back. Don’t let that put you off though, this is a purely local New Braunfels joint and everyone has a smile for you as soon as you walk in.